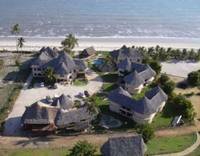 In recent years many new beach hotels have been built in Bagamoyo. Most of the new and good hotels with international standards can be found at the northern and the southern end of town, in a row directly at the beach. 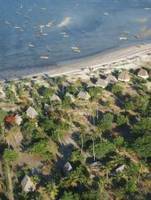 12 traditional Bungalows, located on an exclusive peninsula. All Bungalows are equipped with air-conditioning and veranda, swimming-pool, Kayak-rental, windsurfing, sailing, diving-center, fishing, Bar, Restaurant, sundowner-lounge. Clean rooms, wonderfull pool, excellent for conferences and meetings. 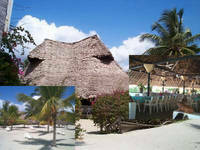 Excellent architecture, clean rooms, good selection at the bar, the beach is very close to the mangrove woods. 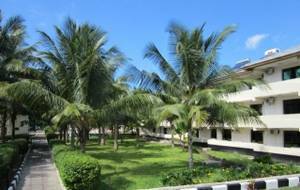 There are three things that recommend the hotel: first the excellent meals, secondly its first class location at the beach (shallow sand beach with a view of the romantic dhau harbour) and thirdly the very good relationship between price and service. You can also often find German or Norwegian foreign aid workers here at the hotel. 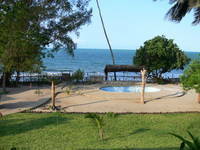 The lodge (opened 2009) is located at a wonderful beach between Bagamoyo and the village of Kaole with its ruins of a historic Persian mosque. A nice place if you don't need shops, discos or nightlife. Optimal relationship between price and comfort. Special prices for groups, students, volunteers, long-term guests. 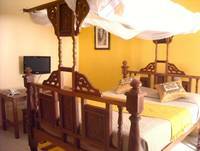 6 rooms with fan and moscitonet, bathroom, veranda. Simple accomodation some km south of Bagamoyo.